In these cold February days being warm might sound like a great thing – but there’s nothing fun about fire hazards. I’ve always been a bit of a worrier. When I was a kid I slept rolled up in my duvet so vampires couldn’t bite me. As a teenager, I started fretting about fire escape routes for my whole family. While both are arguably important things to consider, now I’m grown up I’m trying to think more about how to stop these things happening – like eating a lot of garlic and removing fire hazards. Despite The Prodigy’s suggestion that being a ‘firestarter’ is cool, staying safe is much smarter. The good news is there’s so much basic stuff we can do to protect our homes – yet many of us still don’t do it. For example, did you know you’re four times more likely to die in a fire if you don’t have a smoke alarm that works? It seems basic, but many of us won’t even remember the last time we checked ours. 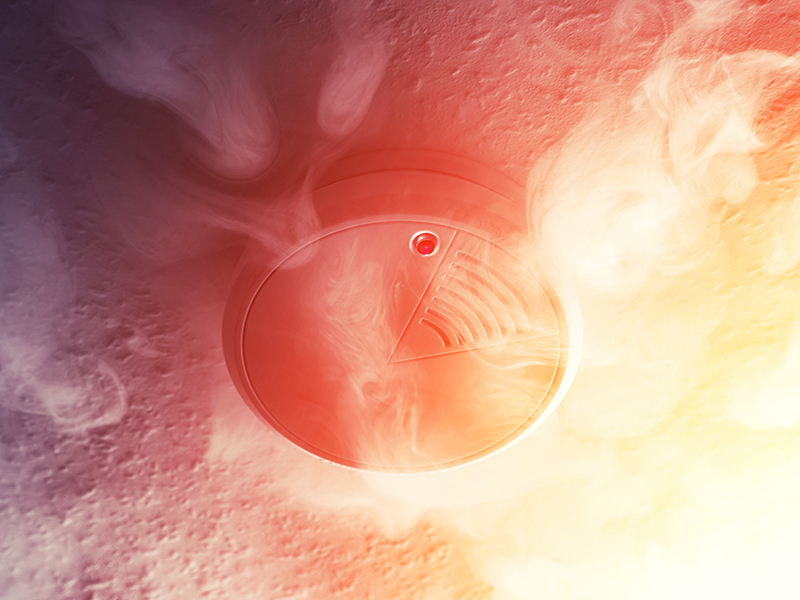 Onward Homes supplies customers with smoke detectors, and there should be at least one on each floor of your home. The hall and landing are the best place. During your annual boiler safety inspection the engineer will give your smoke alarms a good test, but we recommend you test them weekly and let us know if they are not working. Don’t cover or remove the smoke detectors, they are your friends. Around half of home fires are caused by cooking accidents. We’ve all popped a pot of rice on the hob and assumed we had time to watch a casual episode of Killing Eve while it cooks. As someone who’s returned to many pans of burnt rice, trust me when I say it’s best to stay in the room. Another pillar of Kitchen Safety 101 is keeping metal things out of the microwave. If a pan catches fire don’t throw water on it – turn it off immediately and call 999. Finally, it’s easy to forget, but make sure you turn cookers and washing machines off overnight. Candles and cigarettes are huge fire hazards – unsurprisingly – so do a quick check round the house before bed and make sure they’re all out. Heaters and faulty appliances, wiring and overloaded sockets are also a big thorn in the side of fire safety. With that in mind, avoid buying electrical items from market stalls in case they’re fake or defective. If you use a fan or other type of heater, never try to dry clothes on it or put anything over it – like me before my morning cuppa, it’s generally best to keep it away from other things. Remember to turn it off when unattended and at night. As mad as it sounds, reflective things – like mirrors, or even a jar of Nutella – in direct sunlight cause hundreds of fires a year in the UK. Move them out of the path of the sun next time you’re doing some Feng Shui. Be extra careful with children around fires and don’t leave them alone even for a second with open flames or pan handles sticking out over the cooker. Plan an emergency escape route for each person in the house in case the worst happens. Then plan a backup route, putting front and back door keys in a couple of easy to reach places. Many local fire and rescue services will offer a free Home Fire Safety Check Service which pretty much covers everything. Keeping our customers safe is Onward’s top priority, so we work hard to ensure all our homes meet fire safety standards, carrying out regular safety checks throughout the year. While we take our responsibility as a landlord incredibly seriously, teamwork makes the dream work, so we need your help to keep your community safe. For any questions about fire safety in your Onward home, or if you’re worried about your fire door, call us on 0300 555 0600 or email customerservices@onward.co.uk.